We present PrDK: a development kit for programming protocols. 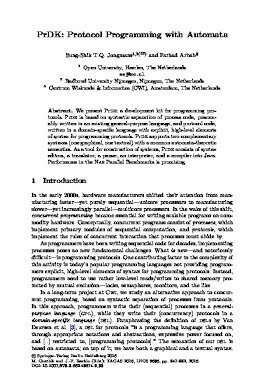 PrDK is based on syntactic separation of process code, presumably written in an existing general-purpose language, and protocol code, written in a domain-specific language with explicit, high-level elements of syntax for programming protocols. PrDK supports two complementary syntaxes (one graphical, one textual) with a common automata-theoretic semantics. As a tool for construction of systems, PrDK consists of syntax editors, a translator, a parser, an interpreter, and a compiler into Java. Performance in the NAS Parallel Benchmarks is promising.